Don’t let the long brown hair fool you—Jennifer O’Connor isn’t the kind of pretty girl who sits on the sidelines cheering for her boyfriend as he pilots his snowmobile to a victory on the drag strip. She’s the rider in the next lane who is giving him a run for his money. The 26-year-old from Leduc, Alberta, started drag racing snowmobiles when she was just 16, and she never did take it easy, even from the start. 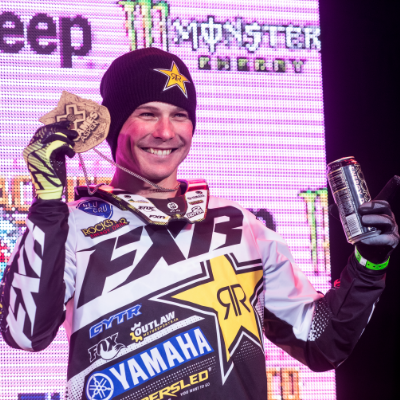 The next season, O'Connor applied for a sponsorship with Arctic Cat and was accepted right away to be on the company’s factory race team. She is also sponsored by VP Racing Fuels, Echo Cycle in Edmonton, Alberta, and O’Connor Vehicle Sales & Leasing in Wetaskiwin, Alberta—where she currently works as a "jill" of all trades. 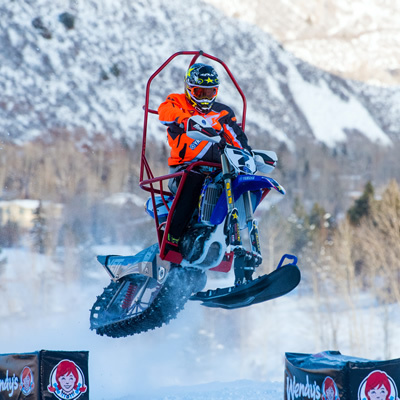 O'Connor follows the Straightline Snowmobile Racing Associate’s (SSRA) 10-round series, which begins in January and runs until mid-March, and she’s usually at every race. 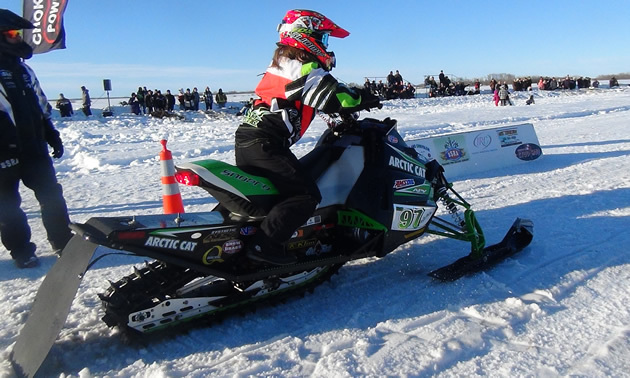 The SSRA is also known as the Saskatchewan Snowmobile Racing Association, and its events take place throughout Saskatchewan, as well as in Alberta and B.C. O'Connor gets a lot of support from her family—especially her father, Tim O’Connor, who helps her with the wrenching. “He’s very mechanically inclined,” she said. “We ordered tear-down manuals for both my factory sleds and just learned ourselves,” she added. Over the years, the father-daughter duo have rebuilt engines and spent hours upon hours in the shop, tuning and testing. Although 2014 wasn’t her best year, O'Connor still has six first-place finishes to show for it. Racing is a fun way to spend the winters, she said, and she keeps having more fun every year. O'Connor competes in eight different classes, seven of which are male-dominated. Being in the minority doesn’t scare her one bit though. In fact, she’s a tough one to beat. O'Connor is even competitive with her boyfriend and fellow Arctic Cat-sponsored racer, Cory Carter. These two actually started off as "frenemies," but eventually their backstage bantering gave way to something more. The pair still enjoy racing against each other, and sometimes, a special race is held just for them. “(At the Western Canadian Championship in Saskatoon, Saskatchewan), we raced against each other but everyone gets such a kick out of our competitiveness that they made a race just for him and I,” said O'Connor. O'Connor enjoys winning, but it’s the camaraderie of the sport that she loves the most. “I’ve made so many friends and met so many people doing this,” she said. When she’s not racing, O'Connor rides in the backcountry. McBride, Valemount and Revelstoke, B.C., are her favourite sledding destinations. In the summer, she doesn’t venture far from the motorsports scene. If she's not tearing down the road on her crotch rocket or in the dunes on her sport quad, you'll likely find her hitting waves on a wakeboard. She’s living life in the fast lane, and loving it.